We sell A. Vogel (Bioforce) products like A. Vogel Crataegus drops (50ml tincture) - Hawthorn online in the UK and directly from our award-winning store in Scotland. Crataegus is a botanical food supplement made from the extract of the fruit of the Hawthorn tree. A. Vogel's Crataegus is produced using extracts of freshly harvested, organically grown Hawthorn berries. The berries are picked fresh and used within 24 hours of harvest. We sell real A. Vogel (Bioforce) and other Heart & Circulation directly from our shop in Scotland and online throughout the UK. Where can you buy real Crataegus 50ml safely online? 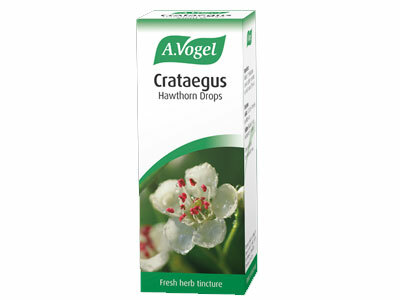 If you are wondering where you can buy A. Vogel Crataegus drops (50ml tincture) - Hawthorn safely online in the UK, then shop with us. We are an actual health foods shop; with real people selling real foods and products. Our award-winning independent shop is located in Stirling, Scotland since 1976. You can buy our Heart & Circulation in store or safely place an order with us online or over the phone. Crataegus 50ml - A. Vogel Crataegus drops (50ml tincture) - Hawthorn in Heart & Circulation and Herbal Remedies, Tinctures & Supplements.